Systematic uncertainty: How well the clock represents natural vibrations, or frequency, of the atoms. NIST researchers found that each clock ticked at a rate matching the natural frequency to within a possible error of just 1.4 parts in 1018—about one billionth of a billionth. Stability: How much the clock's frequency changes over a specified time interval, measured to a level of 3.2 parts in 1019 (or 0.00000000000000000032) over a day. Reproducibility: How closely the two clocks tick at the same frequency, shown by 10 comparisons of the clock pair, yielding a frequency difference below the 10-18level (again, less than one billionth of a billionth). "Systematic uncertainty, stability, and reproducibility can be considered the 'royal flush' of performance for these clocks," project leader Andrew Ludlow said. "The agreement of the two clocks at this unprecedented level, which we call reproducibility, is perhaps the single most important result, because it essentially requires and substantiates the other two results." "This is especially true because the demonstrated reproducibility shows that the clocks' total error drops below our general ability to account for gravity's effect on time here on Earth. Hence, as we envision clocks like these being used around the country or world, their relative performance would be, for the first time, limited by Earth's gravitational effects." Einstein's theory of relativity predicts that an atomic clock's ticking, that is, the frequency of the atoms' vibrations, is reduced—shifted toward the red end of the electromagnetic spectrum—when operated in stronger gravity. That is, time passes more slowly at lower elevations. While these so-called redshifts degrade a clock's timekeeping, this same sensitivity can be turned on its head to exquisitely measure gravity. Super-sensitive clocks can map the gravitational distortion of space-time more precisely than ever. Applications include relativistic geodesy, which measures the Earth's gravitational shape, and detecting signals from the early universe such as gravitational waves and perhaps even as-yet-unexplained "dark matter." NIST's ytterbium clocks now exceed the conventional capability to measure the geoid, or the shape of the Earth based on tidal gauge surveys of sea level. Comparisons of such clocks located far apart such as on different continents could resolve geodetic measurements to within 1 centimeter, better than the current state of the art of several centimeters. 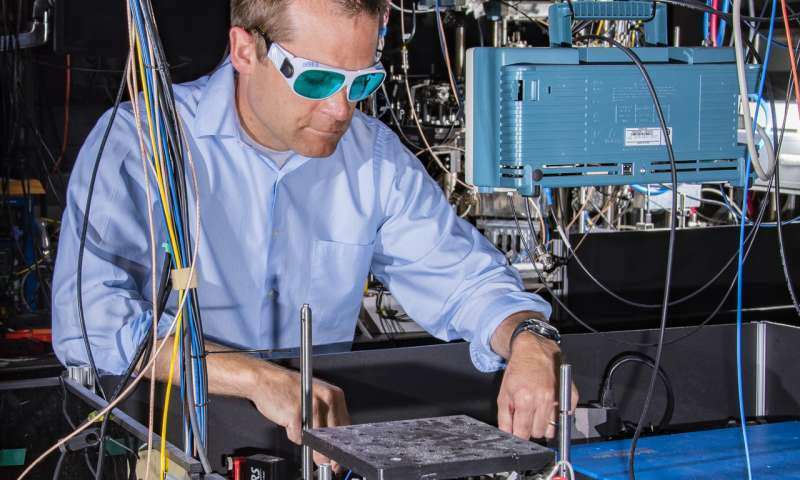 Among the improvements in NIST's latest ytterbium clocks was the inclusion of thermal and electric shielding, which surround the atoms to protect them from stray electric fields and enable researchers to better characterize and correct for frequency shifts caused by heat radiation. The ytterbium atom is among potential candidates for the future redefinition of the second—the international unit of time—in terms of optical frequencies. NIST's new clock records meet one of the international redefinition roadmap's requirements, a 100-fold improvement in validated accuracy over the best clocks based on the current standard, the cesium atom, which vibrates at lower microwave frequencies. This is really remarkable. More tests of ol' Al's theories seem likely. We all saw that Sgr A* caused gravitational red shift from S2 star at its closest approach last May. Another proof, to be sure. When are we going to covert Al's stuff into laws instead of always calling them theories? Question for some of you brainiacs out there. How fast and how far (minimally) would we have to send this clock into space before we would detect any relativistic time shift? And could that data be transmitted back to earth, or would the probe with this clock have to return to earth for us to see the result? That is, the redshift in transmission might be big enough to bugger up these kinds of data transmissions, but I would bet that could be sorted out. After rereading my first post, I realized that speed of the clock launched away from earth is the only relevant aspect of whether you could determine if time slows down. Distance would not matter. The issue is: could we launch this theoretical clock fast enough to determine an impact on it's time read-out relative to earth observers. Great! Let's put some in orbit and have yet another experimental check of GRT. This is actually incorrect. Distance matters very much; a clock in LEO would tick slower than one in GEO. You've made a conceptual mistake; it doesn't matter what happens to the clock during launch. You just synch it with a clock at Earth's surface when it arrives in orbit then watch what happens after that. Introducing the extremely complex math involved in accelerations which can only be measured to much less precision than the rate of the clock is unnecessary and doesn't address the main point. Eventually we should be able to do this when we have the computational power and instrumentation to make it possible, but it's sufficient to show how the clock rates vary once things are stable and synchronization is achieved. I gave you 5s anyway. @Da Schneib, as a biochemist, I am way out of my field. Don't even know what LEO or GEO means. But always willing to learn. "You've made a conceptual mistake" is not quite correct. It is not the launch that matters but the speed of the object relative to the observer, in the most simplistic terms, to approach my question. (I never mentioned acceleration.) It is velocity relative to the observer that I thought matters most. I am working on 40 year old memory here, so take it easy! Einstein's thought experiments regarding time slowing down with objects moving by the observer - "special relativity" if I recall. "With current technology severely limiting the velocity of space travel, however, the differences experienced in practice are minuscule: after 6 months on the International Space Station (ISS) (which orbits Earth at a speed of about 7,700 m/s) an astronaut would have aged about 0.005 seconds less than those on Earth. The current human time travel record holder is Russian cosmonaut Sergei Krikalev. He is 22.68 milliseconds younger than he would have been had he stayed stationary on Earth. He beat the previous record of about 20 milliseconds by cosmonaut Sergei Avdeyev." It would appear that this new clock could easily measure this aspect of special relativity, as you noted, using orbital velocities. That is a wow. On a related subject, I recently read that objects traveling at or below 50% c can be ~ dealt with using Newtonian physics. Only use relativity at > 50% c for high precision. Is this right?! Easy. Low Earth Orbit (within a few hundred miles) and Geosynchronous Earth Orbit (out at about 25,000 miles). You're gettin' it easy. Do by all means stretch outside your limits! I didn't intend to make you feel bad. Just correct my best understanding of what you said. Gravity slows time too, and more the closer you get to the source. I should also remind you that both SR (the type of time dilation you are talking about here), and GR, the type of time dilation that deals with gravity, have been experimentally verified. It's a bit edgy. For a good idea of the effects, use the Lorentz Transform. Gamma is the coefficient you are interested in. You'll find that there are significant corrections needed below 25% of c.
But since nothing launched from Earth has ever exceeded 0.01% c it's not really all that incorrect to say we've never used anything but Newtonian gravity for any space mission. Oh you didn't make me feel bad. Just want to clarify the issues. Would you care to learn about DNA polymerase? LEO and GEO are much simpler than I expected. Never knew these acronyms. Minimal LEO is about 17,000 mph as I recall. Escape is about 25,000 mph. :D I know some things about polymerases, for DNA and other things, but I bet you know a lot more. Heh. I could go look up minimal LEO; the figures I learned early were 7 miles per second for orbit and 11 for escape, but I'd have to look it up and do a lot of calculations. For SR, "the type of time dilation you are talking about here" I understand has been demonstrated by half-life "changes" of cosmic rays entering the atmosphere, with the showers etc. compared to smasher data "rest" half-lives, as I recall. Correct me if I am wrong, or provide additional data would be cool. How was time dilation in GR observed. Was that at SGR A* / S2 encounter also? Or some other? Great fun here!! It was actually first observed in extension of the half-lives of muons from cosmic rays in balloon experiments in the 1950s, but you have the right idea. 7 mps is ca. 25,000 mph. I am quite sure minimal orbital velocity is around 17,000 mph. That is around the speed shuttle re-entries began. But that LEO will decay very fast. The wiki article on the ISS indicate it is moving at around 20,000 mph at alt. of ca. 240 miles. Keeps changing it seems. Dodging stuff, various reasons for its drift in altitude probably. Pretty sure 11 mps is escape velocity. You might wanna check that out. And I mean check my memory too. Orbital velocity is different at different altitudes, and I don't think the ISS is at LEO at 240 miles. I'd expect a higher velocity up that far. And I wouldn't trust an article that uses miles; the real scientific stuff uses SI units. "The mean orbital velocity needed to maintain a stable low Earth orbit is about 7.8 km/s. Atmospheric and gravity drag associated with launch typically adds 1.3–1.8 km/s to the launch vehicle delta-v required to reach normal LEO orbital velocity of around 7.8 km/s (28,080 km/h)." 7.8 km/s is about 17,550 mph. Escape velocity is ca. 25,000 mph, or ca. 11 km/s. But enough of this. On to more GR etc. "Hafele and Keating, in 1971, flew caesium atomic clocks east and west around the earth in commercial airliners, to compare the elapsed time against that of a clock that remained at the U.S. Naval Observatory. Two opposite effects came into play. The clocks were expected to age more quickly (show a larger elapsed time) than the reference clock, since they were in a higher (weaker) gravitational potential for most of the trip (c.f. Pound–Rebka experiment). But also, contrastingly, the moving clocks were expected to age more slowly because of the speed of their travel. From the actual flight paths of each trip, the theory predicted that the flying clocks, compared with reference clocks at the U.S. Naval Observatory, should have lost 40±23 nanoseconds during the eastward trip and should have gained 275±21 nanoseconds during the westward trip. " (This is actually SR experiments). "Relative to the atomic time scale of the U.S. Naval Observatory, the flying clocks lost 59±10 nanoseconds during the eastward trip and gained 273±7 nanoseconds during the westward trip (where the error bars represent standard deviation). In 2005, the National Physical Laboratory in the United Kingdom reported their limited replication of this experiment. The NPL experiment differed from the original in that the caesium clocks were sent on a shorter trip (London–Washington, D.C. return), but the clocks were more accurate. The reported results are within 4% of the predictions of relativity, within the uncertainty of the measurements." Quite remarkable since they were using aircraft flying back and forth over the U.S., at what, maybe 500 mph!! "In 1959 Robert Pound and Glen A. Rebka measured the very slight gravitational red shift in the frequency of light emitted at a lower height, where Earth's gravitational field is relatively more intense. The results were within 10% of the predictions of general relativity. In 1964, Pound and J. L. Snider measured a result within 1% of the value predicted by gravitational time dilation. (See Pound–Rebka experiment)"
I had read that the S2 red shift at SGR A* was the first time GRS had been observed. Must have been hype from the VLT people. Do you believe the data from the 1959 work? That is pretty remarkable if true. I would have never thought the earth had sufficient mass to measure relativistic impacts on such things. But the instruments are getting more and more sensitive. Very difficult to stay on top of this stuff. The Rebka-Pound experiment is famous too. It's particularly interesting because it combines SR and GR results.